ARCHANES, Greece – Marven Obett, 36, seems an unlikely fan of British royalty. Imposing, well-muscled and tattooed, the former gold and diamond assayer is a Syrian refugee, bringing up two young sons, Angelo and Gabriello, alone. They live in an apartment in the town of Heraklion on Crete provided under a major accommodation programme run by UNHCR, the UN Refugee Agency. 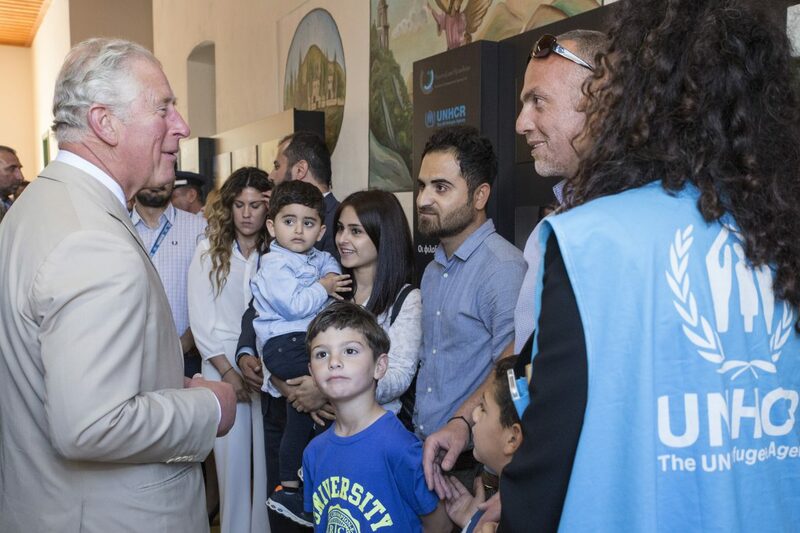 Prince of Wales meets refugees staying in UNHCR rented apartments on the Greek island of Crete on the 11th of May 2018. Marven’s interest in The Queen and her family goes back years, but today he came face-to-face with one of his blue-blooded heroes, when the Prince of Wales and his wife, the Duchess of Cornwall, visited the village of Archanes on the Greek island of Crete. They were here to learn about the EU-funded ESTIA programme and how it is being implement on the island by UNHCR’s implementing partner, the Heraklion Development Agency (HDA) and to meet beneficiaries, including Marven and a three-member family from Iraq. “I’m a big fan,” Marven said about the Prince of Wales before his big moment in the HDA headquarters near Heraklion, while fretting about protocol and what he was going to wear. “I don’t know what we will speak about,” said the outgoing Syrian, who arrived in Crete with his boys after a traumatic sea crossing from Turkey last October. The Prince also met Rebaz Salam Mahmood, 29, a former window glazier from the Iraqi town of Suleimaniyeh, and his 27-year-old wife Sohane, a former secretary. The couple fled from Iraq to escape persecution, ending up in Heraklion after they were rescued from a sinking boat off Crete. They said they were touched by the warmth of their welcome and wished to make a living in Greece. The Prince also talked to local dignitaries and HDA staff in picturesque Archanes and he was briefed by UNHCR Representative in Greece Philippe Leclerc and HDA Refugee Project Director Dimitra Kampeli on ESTIA. The programme has aided more than 45,000 refugees and asylum seekers across Greece since it was launched by UNHCR in early 2016. More than 800 people have benefitted, living in 150 apartments in Heraklion, Chania and Sitia. “We welcome the visit of their Royal Highnesses, which is helping to put a spotlight on something very positive arising out of the difficult refugee situation that Greece has been bearing for the last few years. The focus is turning now to integration,” said UNHCR’s Philippe Leclerc. Both men also talked about integration and their desire to start a fresh life in Greece, and the challenges they faced. “We like it here very much. The people and hospitality are great; all we worry about is finding a job,’” Rebaz said, echoing Marven, who spends much of his time playing mother and father. They both want to become self-sufficient in the future. Language is an important part of integration, and the adults from the two families are taking Greek lessons. This would better equip them for employment, but funding is an issue. Marven’s boys are learning quickly and their father keeps them active. Aside from the ESTIA project in Crete, UNHCR is also piloting an alternative care project for unaccompanied children in Heraklion, Supported Independent Living. This project, the first of its kind in Greece, was explained to the Prince of Wales. Under the programme, which UNHCR hopes to expand, groups of four boys aged 16-17 years share an apartment, study Greek and build resilience and life skills before reaching adulthood. The UK and some other countries have good experience of SIL. The ESTIA programme currently provides almost 25,000 apartment places across the country. It is likely to grow amid continuing demand. It has helped move the most vulnerable into safe and appropriate shelter. There is currently and estimated 51,000 refugees and migrants in Greece.